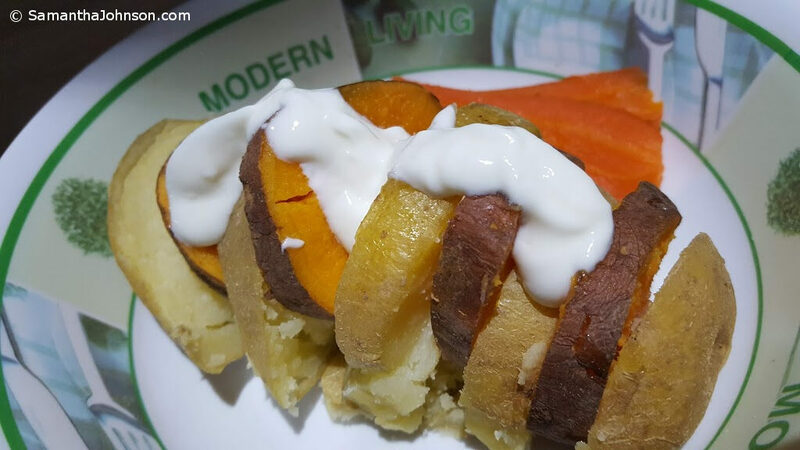 Potato Diet Recipes – Sliced Sweet Potato Jackets with Sour Cream. I love spuds but if you fancy some sweetness then using sweet potaores is a nice addition and low in calories! However they are VERY sweet if you overdo it! So go easy. The sour cream dressing helps offset this sweetness so give it a try! 2 Large Jacket Potatoes Baked in the oven or Microwave until soft (but firm enough to hold a slice). 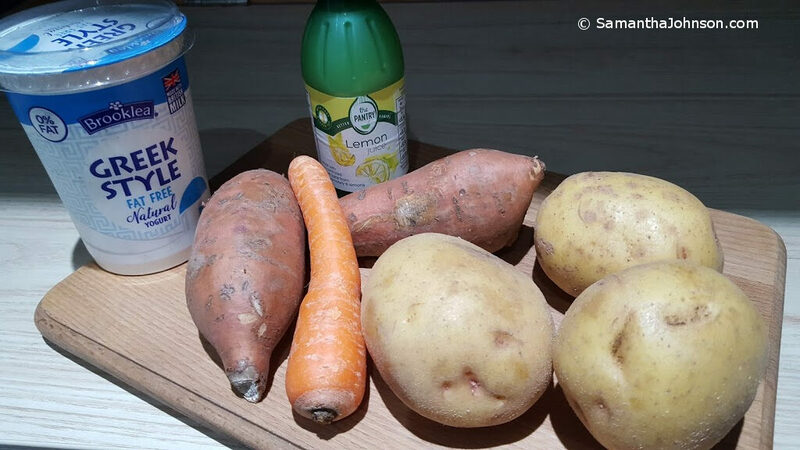 1 Large Jacket Sweet Potatoe Baked or Microwaved (as above).1 Carrot Microwaved (to add some more sweetness). 1 Tablespoon Fat Free Greek Yoghurt.1 Teaspoon Lemon Juice Pinch of Chives (Optional). Chives add a bit of traditional flavour to this well known cream dressing. Plus they add colour. I personally leave them out but you can add them. 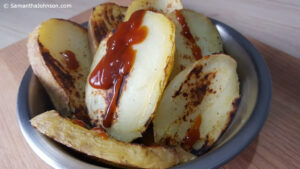 Slice potatoes and alternate them (one slice potato, one slice sweet potato). Cut across the top and press sides to open center.Season with Salt and Pepper and a Pinch of Engevita Yeast Flakes with B12. B12 is important as the potato diet whilst covering almost all your daily needs lacks this vitamin supplement. Place the yogurt in a bowl sprinkle lemon juice to tase and mixe up. Spoon half the Dressing between them and fork into the mash (flavour). Spoon the remainder on the top for presentation. Slice carrot to decorate plate. This adds some sweetness and richness to an otherwise drab tasting potato diet. You can simply add a peice of Chicken Breast or Fish for the rest of the family not on the diet.